MATERIALS FURNISHED: One hardware pack, two end castings, cross bar, instruction page. 1. Two people will be needed to complete this task. 2. Place ONLY THE MOUNTING END CASTINGS with the Rubber Booties into the rain-gutters. 3. Level each Mounting End Casting so that the top flat area is parallel to the horizon. 4. Take a tape measure and measure the distance between each open end of each Mounting End Casting . 5. Add 4 inches to that dimension. 6. Subtract that total from the total length of the bar, which is 56". 7. Take the difference and divide it by two. 8. The amount divided by two is the amount you will cut off each end of your bar. > Do not over tighten the nuts and bolts or damage to the castings and or stripping of the threads could result. > FOR SAFE AND PROPER USAGE OF THIS PRODUCT, THE MOUNTING INSTRUCTIONS MUST BE FOLLOWED CAREFULLY AND COMPLETELY. > The manufacturer and distributor of this product are in no way responsible for the consumer’s failure to adhere to the warnings and directions of these instructions in the event of damage to the consumer’s vehicle, other properties and or personal injury. > DO NOT REMOVE the PVC tape from the light bar until cutting is completed. When cutting black bar leave plastic bag on and wrap a rag around bar before putting into a vise so no scratching of paint will result. Remove the PVC tape from the brackets (does not apply to black brackets). The light bar will not tighten properly unless the bar is straight across the cab. 1. Please read the light bar cutting instructions on back carefully. 2. Measure and mark a line on both ends of the steel bar using the dimensions provided. 3. Clamp the end of a bar into a vise. (Be careful not to scar the light bar). 4. Using a hacksaw, cut carefully along the marked lines. (If a vise is not available, put the bar on a table, secure tightly and cut). 5. Place the black plastic booties on the feet of each casting. 6. With the holes in the bar, in the up position, take the casting and by squeezing the end of the bar, place the casting on the bar, until the inside top wall of the casting is flat against the bar. 7. Take a 5/16" Allen head screw and put it through the hole in the casting, and the slot in the bar, with the head of the screw in the up position. 8. Take the larger washer and put it inside the bar, with the 5/16" Allen head screw, going through the washer. (IMPORTANT): Be sure that the large washer is completely underneath the casting. 9. With the larger washer in position, take a nylon lock nut and Allen wrench provided, and lightly tighten the bar to casting. 10. Follow the same procedure in steps 5 - 9 to attach other casting to the bar. 11. With both of the castings lightly tightened to the bar, take the entire bar and place the bar, with the castings, into the rain gutter of your vehicle. (Note: If your vehicle does not have rain gutters, please refer to the SPECIAL NOTE on the other side of this page). 12. 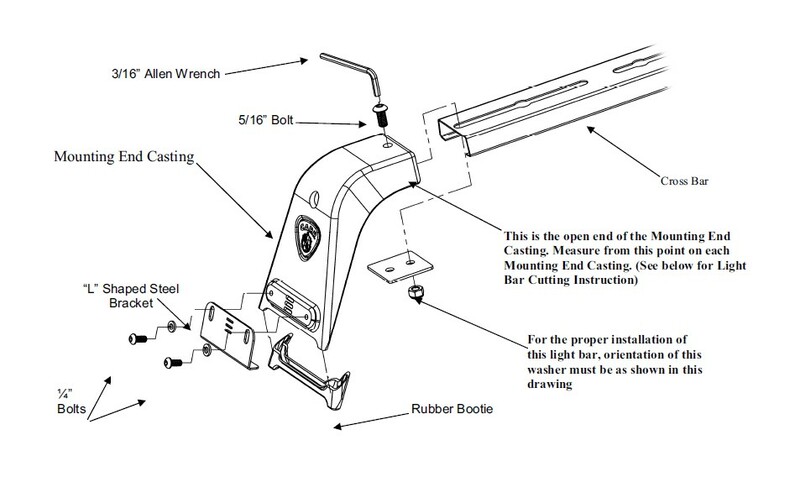 Loosen, DO NOT REMOVE hardware on bar and casting. 13. Slide castings in or out on bar, so that each casting sets completely in rain gutters. (IMPORTANT): Make sure that the bar is centered and that the bar is evenly divided into each casting and that each casting is directly across from each other. 14. Once again, take the Allen wrench and tighten securely the bar to each casting. 15. Position the foot of the “L” shaped steel brackets underneath the rain gutter and line up the vertical slot of the bracket with tapped hole in the casting. Insert (2) ½" Tamper proof Allen head bolts with lock washers through the “L” bracket securing the bracket to support casting. (DO NOT TIGHTEN). 16. Place a screwdriver through the desired horizontal slot in the steel bracket, at the same time put the screwdriver into one of three slots provided in the casting. (Proper selection of the slots in the bracket and the slots in the casting will result in a tighter fit on the vehicle.). 17. Push the screwdriver against the casting and pry up against each bracket, one at a time, until both the casting and brackets are tightly secured in place. Tighten the two Allen head bolts. (CAUTION): Prying up excessively could result in bending of the bracket or stripping the slots in the castings. 18. Follow the same procedure in steps 15, 16, and 17 to secure other casting to rain gutter. 19. The bar and casting should now be tightly secured to the vehicle. 20. Your light bar hardware may settle in. After 2 or 3 weeks of use, go back and re-tighten all hardware. A periodic check on all hardware is recommended. 21. Do not lose your Allen wrench. 22. To maintain the luster of your light bar, apply a polish on a regular basis.